← Reaching Out to More of the World! Yes I said it… BACON… Wow what is even better than homemade Mac and Cheese? Homemade Mac and Cheese with BACON! I was in one of them cooking moods that I tend to get in from time to time and wanted some good comfort food. I looked in the pantry nothing jumped out at me, look in the cupboards still nothing. Finally I took a look in the fridge and found a bunch of cheese and bacon I knew I needed to cook (It was 5 lbs of bacon, I cook it in large amounts then freeze it. It makes for easy week day breakfasts.) So going back to the pantry, I found I had a lot of noodles. Yep you guessed it Mac and Cheese time. (Note: I try my best to write down my recipes, to make them simple as I can, problem is that I don’t really cook by recipes). Hope you enjoy… There are never and I mean never any leftovers when I cook this. * Plus a little more of the Parmesan & Romano shredded cheese to sprinkle at the end. Cook the 8 slices of bacon in a large frying pan. When finished lay on paper towel to drain and cool. Drain all but two table spoons of bacon grease. Chop one small onion. Now by this time the bacon should be cool enough to dice up. Set bacon aside. On a high heat, in Large frying pan with bacon grease add diced onion and sprinkle with salt and pepper. saute onion for about 2 minutes until it has become translucent. Add minced garlic and saute for 1 minute. Reduce heat to medium and stir in flour. Keep stirring for about 1 minute. Now gradually add in milk and heavy whipping cream stirring at all times. Continue to stir over medium heat bring sauce to a simmer. Reduce heat to low and continue to stir. Now while you are stirring the cream (roux) add your noodles to the prepared pot of water which should be boiling now. I cook my penne pasta for about 7 minutes. Once the ten minutes is up you can turn the heat off. (remove it from burner if you are using an electric stove). Stir in Cheeses and mix well. your cooked pasta which should be done by now and drained into the cheese mixture along with the diced up bacon. Mix well. Pour it into your 9 x 13 greased casserole dish. Now this is the only oven part: Sprinkle with more of the of Parmesan & Romano shredded cheese. Put under the broiler until cheese starts to bubble and turn a light golden brown. (Make sure you watch it carefully it only take a couple of minutes). 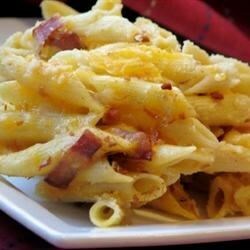 This entry was posted in Recipes and tagged bacon, blogging101, blogs, Homade, Homemade Mac and Cheese with Bacon, Mac and Cheese with bacon, recipes. Bookmark the permalink.